The Spinsterz Weighted Hula Hoops Are Your Best Bet For Getting Fit and Having Fun! I could write a bunch of fancy sales ad type stuff, but instead I just want you to know the facts and that you are buying from a company that has been around for 13 years in the hoop business and has a stunning reputation. Just google "The Spinsterz" and you can read up on us for yourself. We want you to get the RIGHT hoop for what you want to do with it, so give us a call, email, Instagram shout, we REALLY want to make sure you get the perfect hoop to fit YOUR body. Hoops are made from a thick Polyethylene plastic. Hoops coils down for travel with the single push of a button. Hoops are wrapped in shiny metallic tape and finished off with a cloth tape called Gaffer Tape that is there to facilitate the hoop gripping your body. Great for smaller bodies and more advanced hoopers. The above are just guidelines to go off of and are not concrete as every body is beautiful and unique. If you have any questions at all, please do get in touch, we will get back to you in 24 hours or less! 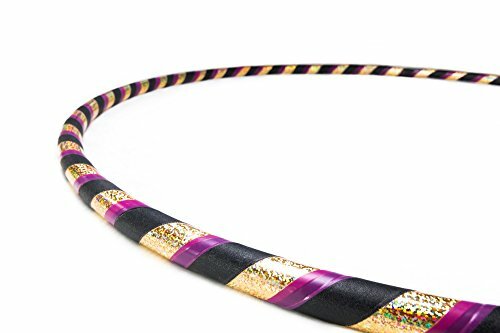 We've been in the hooping industry for 13 years, we were actually one of the first companies to offer Adult Hula Hoops, so we know what makes a good hoop. Our hoops top out at 2 pounds for a reason, hooping with a heavier 2.5 or 3 pound hoop is actually very BAD FOR YOUR BACK. Don't fall for the hype of those "foam or wavy fitness hoops". Seriously, we want you to be healthy and feel good! Message us, we'd love to get you the best hoop to meet your goals. Our Adult size Fitness and Exercise hoops come with a no questions asked 90 day money back guarantee. We also have a LIFETIME warranty on all our hoops, if you break it, we'll replace it. We make our hoops with professional quality materials and spend a lot of time making sure it's going to be a perfect hoop for YOU! Contact us if you have any questions at all. We LOVE helping our fellow hoopers make good choices and fit them with the PERFECT hoop for their unique body type. REVIEW? Please! If you like your hoop and shopping experience, would you PLEASE PLEASE PLEASE leave us a review? That would mean the WORLD to us. ❤︎ Thank you! If you have any questions about this product by The Spinsterz, contact us by completing and submitting the form below. If you are looking for a specif part number, please include it with your message.